Ever since Orlando became one of the most popular vacation destinations in the United States, it also became one of the most popular ports for cruise departures. Port Canaveral is now among the busiest cruise ports on the East Coast, and although it is mainly a departure/arrival point rather than a destination, tourists will find no end to interesting activities and sightseeing opportunities. 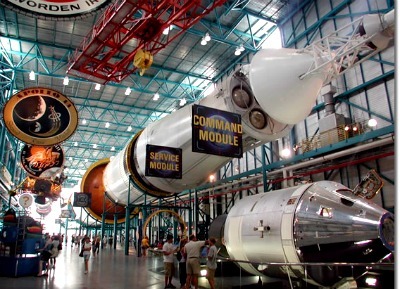 The port itself is located near the Kennedy Space Center, just a 50 minute drive east of Orlando. If you want to mix up your cruise itinerary just a bit, consider working in a magical weekend in Orlando, or just take some time to enjoy the beautiful Atlantic beaches - and the great surfing - in and around Port Canaveral. Carnival Cruise Lines operates from Terminal 5 or Terminal 10 at Port Canaveral, as does the Royal Caribbean Line. Other cruise lines have or share other terminals. There are very few sightseeing opportunities near the piers, nor are there many shops except those located at the Cove Marketplace. However, taxis can be hailed at the dock facility and shuttle service is available to take cruise passengers to and from Orlando. Port Canaveral offers up some of the best surfing on the Atlantic Coast, and the Canaveral National Seashore is one of the longest undisturbed stretches to be found anywhere. Very secluded, it is perfect for strolling, beachcombing and otherwise just relaxing away from the hustle and bustle of cities. In Cocoa Beach, families will enjoy spending time at Lori Wilson Park on North Atlantic Avenue, where the water is shallow and perfect for swimming. Historic Cocoa Village, smack in the center of the Indian River citrus fruit country, has a number of restored buildings and has a good mixture of boutiques, souvenir shops and restaurants. And of course a trip to the Kennedy Space Center is one of the most memorable visits you will ever make. If coming from Orlando, you may want to stop at Walt Disney World complex, where you will find no end to all types of entertainment. From the Magic Kingdom to the futuristic displays at Epcot Center, this is one of the most visited theme parks on earth. Disney also operates its Hollywood Studios near the Magic Kingdom, where many of the popular TV shows are filmed. And at Universal Studios Florida, you can tour the entire facility and take in the fun rides, enjoying exhibits depicting the production of some of TV and cinema's most famous characters. Sea World Orlando, near the southern end of International Blvd and close to the Orange County Convention Center is another top attraction in the area. 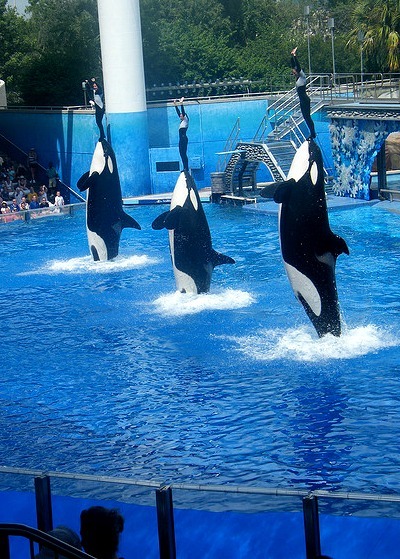 Here you can feed the dolphins, explore the Wild Arctic exhibit and visit the orcas at Shamu Stadium. Both Port Canaveral and Orlando are full of dining options, and aside from the theme-oriented establishments at or near Walt Disney World, Orlando has a good mix of traditional and regional specialty restaurants. At the City Fish Restaurant in downtown you can enjoy fresh grilled lobster, extravagant seafood burgers and various shrimp delicacies. The popular Tijuana Flats, also located in downtown, has the best Tex-Mex cuisine in the city. In the Port Canaveral area the Grill's Seafood Deck and Tiki Bar is located near the terminals on Glen Cheek Drive and has a commanding waterfront view that is as wonderful as the seafood itself. Coconuts on the Beach is a fun restaurant in the Cocoa Beach area, located on Minutemen Causeway and offering some of the best clam chowder in the state. To travel between Port Canaveral and Orlando you can either take a taxi or use a shuttle bus service. However, most cruise travelers feel more comfortable renting a car, especially if they are planning to spend some time in Orlando before or after their cruise trip. The Lynx public bus service operates routes from downtown Orlando to International Blvd and the various theme parks. Both Orlando and Port Canaveral have a number of Internet cafes, and passengers arriving by air have Internet connection and WiFi available at the airport. When visiting the eastern part of Florida, make sure to bring a light slicker or umbrella, as rain squalls are common. Changing currency is not important, as most Caribbean and Bahamas cruise destinations are ports where U.S. dollars are accepted. 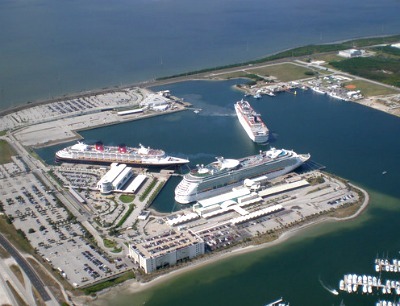 Cruise ships at Port Canaveral. 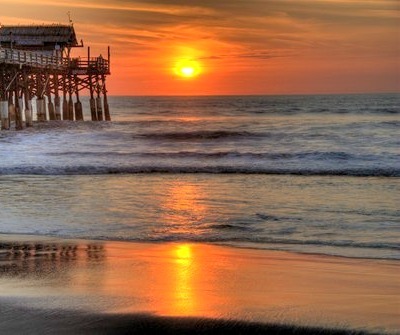 You can enjoy a beautiful sunset from the Cocoa Beach. A look inside the Kennedy Space Center. Dolphins holding up their trainers at Shamu Stadium.